A common subject painted in medieval churches where scenes of the "Last Judgment" or "Doom". 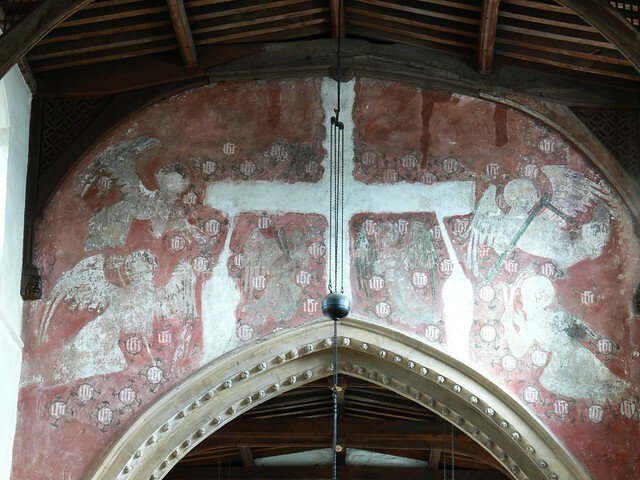 Often they would be painted above the chancel arch. A central figure of risen Christ with the instruments of the passion would be painted, or a crucifixion with the Virgin Mary and St John the Evangelist. Other motifs might include St Michael Weighing Souls, and the dead rising from their graves. Demons might also be leading or throwing the damned into hell. The painting above, dated to about 1420, is from St Peter's Raunds in Northamptonshire originally there would have been a central statue of a crucifixion that would have completed the scene. The painting contains six angels holding the instruments of the passion, with the Virgin Mary and St John the Evangelist on either side of the cross.